This entry was posted on February 27, 2018 by Jessica Anderson. The best of the best receive this trophy for our industry! 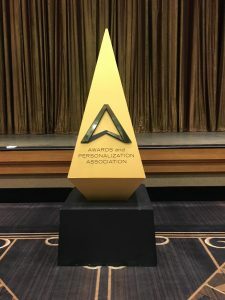 Last week Tom, Lori N. and I attended the 2018 Awards and Personalization Association (APA) Expo in Las Vegas, NV. The awards industry's biggest event, it gives trophy and awards retailers the chance to meet with manufacturers and sales representatives face-to-face. Industry leaders from across the country meet to network, receive education through seminars, and touch and feel the newest award products and personalization machinery. There is even an achievement gala where the best in the awards industry is recognized with The Gold Obelisk Industry Awards! 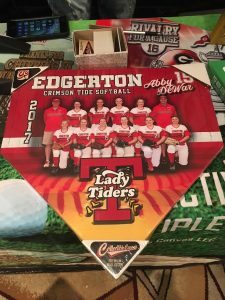 A cool new product we saw at the show, its a canvas photo shaped like a home plate! New Products: We will be adding many new products to our website soon! Watch for new Fantasy Football Trophies, new colorful art glass awards, glassware including wine and barware sets, glitter acrylic awards, to name a few. 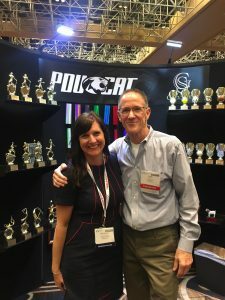 Meeting Suppliers: We had great conversations with our key suppliers, including Kathy and Greg from Tropar Manufacturing, Casey, Erick, & Brianna from Simba Cal, Dan from PDU/Cat, and Larry from Crystal Blanc . Dan L from PDU/Cat, our top vendor. Networking with Competitors: Yes, we all own awards businesses, and we are technically in competition with each other. But because our industry is so small, and what we do is positive, we have a very supportive and helpful community. The phrase "a rising tide floats all boats" seems to apply in our industry, as when recognition across the country grows, so does our sales. Each awards company seems to occupy an unique niche market so there is business for all. After Hours: Since it's Vegas, there's lots of opportunity to have fun with friends! Gambling, delicious food, and schenanigans are always in the cards in Vegas! Thank you to the APA board members, committee members, and staff for putting on a great show this year. Also thank you to the Rio for hosting our event. See you all in 2019!